Ohio Sophomore Nathan Rourke (12) runs behind the block of Austen Pleasants (60) and Steven Hayes (73), during Rourke’s first scoring run on Oct. 7 in Athens, Ohio. BOWLING GREEN, Ohio — The Bobcats gave their opponent a 15-minute head start, but still won the race by a comfortable margin. The Ohio University football team survived a scoreless first quarter on Saturday in Doyt L. Perry Stadium, as the Bobcats roared back to take a 48-30 victory over Mid-American Conference host Bowling Green. Bowling Green (1-6, 1-2 MAC) — which claimed its only win of the year over Miami University — scored twice in the opening stanza, as Jake Suder made field goals of 42 and 34 yards. The Bobcats (5-2, 5-1) punted on their first three possessions, but recovered a BGSU fumble with 2:00 left in the first quarter, giving the guests great starting field position at the Falcon 27. Ohio took advantage and evened the score on the first play of the second quarter, as A.J. Ouellette found paydirt on a six-yard run. Louie Zervos kicked in the point-after, giving OU a 7-6 lead with 14:54 left in the half. The Ohio lead was short-lived, however, as the Falcons went 75 yards on seven plays on the ensuing drive, with Andrew Clair capping off the possession with a three-yard touchdown run. Suder made the point-after, giving BGSU a 13-7 edge with 13:07 left in the half. The Bobcats were intercepted on their next possession, giving the Falcons just 46 yards between them and the endzone. However, Ohio’s defense stood tall, stopping the Falcons one yard short on a fourth down. Ohio made it as far as the BGSU 31, before being backed up to the 33 and having to punt. The Michael Farkas punt pinned the Falcons back to their own three-yard line. On the Falcons’ second play from scrimmage, OU senior Bradd Ellis intercepted a pass and returned it 15 yards for the touchdown. Zervos’ point-after kick gave Ohio a 14-13 edge with 8:24 left in the half. The Bobcats tossed another interception on their next possession, and it led to a 32-yard field goal by Suder, giving Bowling Green a 16-14 advantage with just 2:37 until halftime. It was more than enough time for the Ohio offense, which covered 82 yards in seven plays and 1:26. Rourke, who was 5-for-5 passing on the drive, delivered the final blow, scoring on a seven-yard run. Zervos’ extra-point gave the guests a 21-16 lead at halftime. Both teams punted on their first and second possessions of the second half, and Bowling Green wound up with the field position advantage, starting its third drive from the OU 49. Two plays after a third-and-10 conversion, BGSU regained the lead, as James Morgan tossed a 10-yard scoring pass to Hunter Folkretsma. Suder added the extra-point, giving the Falcons a 23-21 lead with 3:41 left in the third quarter. The ensuing kickoff went for a touchback and on Ohio’s first play from scrimmage, Rourke rushed for a 75-yard touchdown. Ohio’s two-point conversion try failed, leaving the Green and White with a 27-23 advantage. BGSU was forced to punt on its next possession, and Ohio’s offense took the game into the fourth quarter. On the second play of the finale, Rourke found Andrew Meyer for a 40-yard scoring passing that, with Zervos’ extra-point, extended the Bobcat lead to 34-23. The Ohio defense came up with another takeaway on the ensuing Falcon drive, as Quinten Poling forced a fumble and Ellis recovered it on the BGSU 20. The Bobcats gave the ball to Ouellette for three straight carries, the first two went for nine yards apiece and the third ended in the six points. Zervos’ extra-point made the Ohio lead 41-23 with 11:02 remaining. The Falcons were able to answer on their next drive, as Clair scored on a one-yard run, which was set up by a 69-yard pass from Morgan to Scott Miller. Suder’s point-after trimmed Ohio’s lead to 11 points with 9:23 to play. After a three-and-out and a Bobcat punt, BGSU came up four yards shy of a first down on a fourth-and-short, giving the ball back Ohio. The Bobcats drove the final nail in the coffin, covering 41 yards in nine plays and 5:21, with Rourke scoring on a one-yard run. Zervos’ added the point-after to make it a 48-30 OU lead. If Ohio’s final touchdown didn’t seal the win, Bobcat freshman Dylan Conner did, intercepting a BGSU pass on the hosts final possession. For the game, Ohio held a 440-to-421 advantage in total offense, including 335-to-229 on the ground. The Bobcats earned a 4-to-2 win in the turnover battle, but had four fewer first downs than the 22 BGSU earned. Ohio punted eight times, three more than Bowling Green. The Falcon offense held the ball for 3:48 more than Ohio’s. The Bobcats were just 2-of-11 on third down conversions, but were successful on their only fourth down try. Meanwhile, Bowling Green was 7-for-19 on third down conversions, but was unsuccessful on both of its fourth down attempts. Ohio was penalized six times for a total of 58 yards, while BGSU was sent back five times for 55 yards. Rourke was 7-of-22 passing for 105 yards and one touchdown, while leading all Bobcat rushers with 143 yards and three touchdowns. Ouellette had 123 yards and two scores on 24 carries, while Dorian Brown added 71 yards on 10 totes. Meyer had 84 yards and one touchdown on three receptions to lead the Bobcat receiving unit. Ouellette hauled in one pass for seven yards, Brendan Cope and Cameron Odom each added one six-yard reception, while Brown caught a two-yard pass. Javon Hagan and Evan Croutch tied for a team-high with 11 tackles apiece, including eight solo tackles each. Poling finished with 10 tackles, including a team-best two tackles for a loss. Along with Poling, Andrew Payne also had one sack in the win. For BGSU, Morgan was 16-of-41 passing for 182 yards with one touchdown and one interception. Clair earned a game-best 148 yards on 19 carries with two touchdowns, while Scott led all receivers with 95 yards on six receptions. Bowling Green’s defense was led by Fred Garth with eight tackles and one interception, followed by Marcus Milton with seven tackles and an interception. This is Ohio’s first win at BGSU since 2011. The Bobcats improve to 6-7 against the Falcons in the head coaching tenure of Frank Solich. 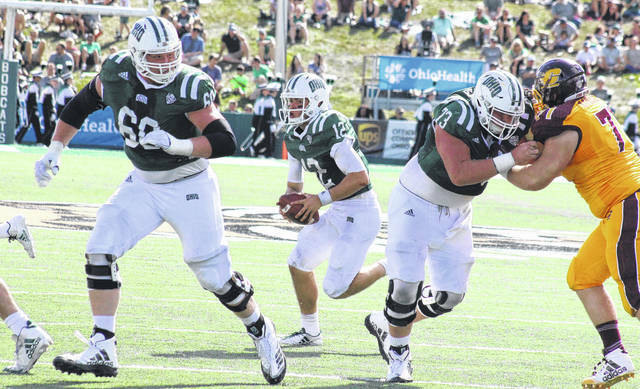 The Bobcats return to Peden Stadium on Saturday for a MAC clash with Kent State at 2 p.m.